I picked up one of those small, round watermelons for dinner last night, as a we're-almost-to-summer treat for the children, and cut it into dinosaur shapes to go along with our current family read aloud - Nathan Aaseng's American Dinosaur Hunters. The book is part of the "Collective Biographies" series from Enslow Publishers, written for fifth to eighth graders, featuring short biographies of people from various careers, or historical positions. 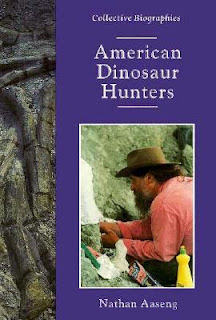 Aaseng's volume highlights the lives of ten, American paleontologist from the mid-19th century's Edward Hitchcock, who first catalogued fossilized tracks in this country, to men still alive and working today, like Robert Bakker, or Montana's own Jack Horner. I originally picked the book up for the older children to read on their own, if they wanted too, but after perusing it, decided it might also interest the younger children, so we're reading it together. Even though it is a book of biographies, it is written, as are most books about dinosaurs, from an evolutionary perspective. But, the chapters are short, leaving lots of time for discussion. And, I am currently reading Faith, Form, and Time: What the Bible Teaches, and Science Confirms About Creation, and The Age of the Universe by Kurt Wise, to be better ready for those discussions. As to the watermelon, that was simple. 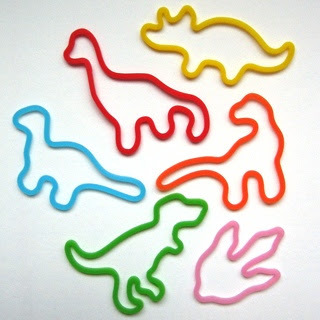 I found a picture of dinosaur bands online, and saved it to my computer so I could enlarge the picture, and trace the shapes right off the screen onto white paper, which I then traced onto wax paper, and cut out. I sliced the watermelon into rounds, about an inch and a half thick, and cut the dinosaur shapes out, around the wax paper cutouts, with a sharp knife. Each round fit about two cutouts. I cubed the scraps into a separate bowl, for later. It was sticky work, but not difficult. The T-Rex and Triceratops ended up being the easiest to cut out. I think next time I might stick to those two, just to make things even easier. Linked with Read Aloud Thursday, at Hope Is The Word. I love your watermelon dinosaurs! Ooohhh, I bet that would also work with cookie cutters. Your watermelon dinos are adorable. You can use cookie cutters, too. We make stars for the 4th of July. Phyllis - I don't have any dino cutters, or I probably would have done that - but I'll remember the stars for the 4th! So excited to be able to eat watermelon again! I don't think I'd have the patience to cut out all those dinos by hand but I like the idea of cookie cutters. I love the watermelon dinosaurs - we will definitely try that. Like Phyllis, we have made watermelon stars, but I never even thought of using other cookie cutters. Wow, I'm impressed you did it without cookie cutters. I would have been frustrated with the wax paper and knife lol. Great job and looks super yummy! I'm always interested in nonfiction titles! I must say that that watermelon looks delicious! Thanks for linking up to RAT!